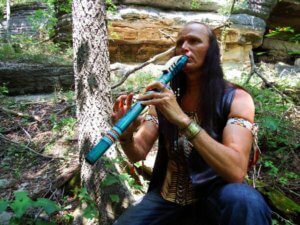 Take a journey with Grammy® and Emmy® nominated Native Flute recording artist John Two-Hawks into the mysteries of the hokagapi; that ancient indigenous woodwind that makes a voice to the song of your heart, was used to serenade a beloved, and became an instrument of healing for a line of medicine people. A fun experience of interesting exploration of the amazing, enchanting Native American Flute, with stories, lessons and song! Flutes will be available to borrow or purchase during the workshop. Saturday, July 20, 2019, 2-5 p.m.
Class Fee: $55/person. Advanced registration deadline is July 14. Walk-ins: $80. John Two-Hawks is a Grammy® and Emmy® nominated, Platinum Award Winning recording artist, author and activist whose music has been featured in movies by Fox Searchlight, films by HBO, and programs by The History Channel. From the start, John recognized the power music holds to help human beings transcend their differences and heal. It is with this knowledge in hand that Two-Hawks has always created his music and shared its message with his global fan-base. John has always believed that if we all use our gifts in a way that plants seeds of hope and love, one day we will realize the dream of a world where diverse cultures and nations can share the planet in peace with one another. All of John Two-Hawks’ music carries this vision, that just as tiny drops of rain wear away the greatest of stones, so can our tiny drops of love wear away the greatest stones of hate and fear. With his music and his words, he has reached into a hurting world, sharing the healing power of love, compassion and humility. Always, Two-Hawks has held fast to his Oglala Lakota Sioux lineage and culture, and it is from this place that the soul of the music he creates and breathes to life is born….